Now this is an interesting book that is just a little bit hard to categorize. Part sci-fi, part mystery, a little YA, and part environmental fiction. Kate Standish is a communications engineer with a service dog (Hattie). They have arrived on the moon colony of Huginn in the Yggdrasil system and will be working in a forest community on the outskirts of anything resembling a central city. It doesn’t take long for Kate to realize that a number of things aren’t quite ‘right’ in this settlement. She arrived on Huginn to work for Duncan Chambers, but Chambers is dead and she’s now doing his job. In addition to her work, she sets out to uncover the details of Duncan’s suspicious death. In addition to the strange new surroundings of this world, there is a pack of wild dogs terrorizing the settlement, and descendants of the moon’s first settlers have formed a pseudo-religious commune called Word Made Flesh and they are acting quite strange. And then there’s something strange with the world itself, which is just being discovered by a local biologist (who happens to be Duncan’s male lover). There’s a lot going on here and yet none of it feels excessive. Wagner does a nice job of integrating all the story-lines into one interesting and absorbing story. I was particularly caught up in the environmental aspects of the story – although admittedly this didn’t really shine through until much later in the story. Environmental science is not explored often enough in science fiction (in my opinion) despite its being a foremost concern on our planet today. Addressing it here gets major kudos from me. The sci-fi aspects are pretty obvious, given that this takes place on the moon out in a system that I’m not aware is actually a named system yet. However, I also greatly appreciate the nod to the Nordic mythologies that Wagner includes here (I hope we’ll hear about another moon, Muginn, in future volumes). The mystery is pretty clear – who killed Duncan? But why do I think there’s an aspect of YA about this book? Mostly because of Kate Standish. While Standish is not a teen, or even a very young adult, there’s an amiable, gentle, even innocent wide-eyed quality about her that at once makes her charming and a little boring. There are moments when she pushes hard and seems to stretch herself and these times she’s more interesting. This wasn’t my favorite sci-fi book of the year, but there’s a lot here that appeals and it’s strong enough that I feel good about recommending it and I look forward to the next adventure with Standish. Looking for a good book? 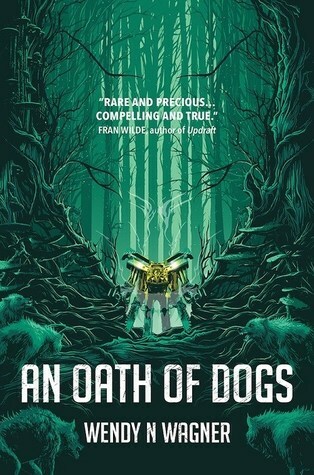 An Oath of Dogs by Wendy N. Wagner is an adventurous sci-fi mystery with an environmental bent that is an enjoyable read.